There's something comforting about having a long time favorite like The Jon Spencer Blues Explosion still making records in 2015. I've been a pretty gigantic fan of JSBX since 1995's Orange. That record stands as one of my very favorite records of all time and I've perhaps unfairly compared every other record this band has ever released to that seminal masterpiece. So let's get it out of the way right upfront. 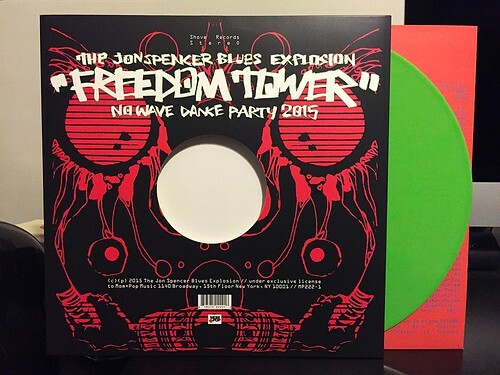 No, Freedom Tower isn't as good as Orange, but it's still a pretty great little record. It's a progression away from 2012's Meat + Bone. While Meat + Bone was more of a fuzzy howling garage inspired record, Freedom Tower sees Spencer and company going back to a cleaner sound and a funkier vibe. While I'm not sure this is a proper dance party as the title suggests, the record has a strong groove and is the sort of thing that makes you catch yourself bobbing your head along to the tunes. I do find the vocals to be somewhat more high pitched than usual, but the more I listen to the record, the more it fits in with the songs. I've never though lyrics were particularly important to the Jon Spencer Blues Explosion experience. To me they've mostly just felt like random things for Jon to shout in between scorching guitar outbursts. While there is some of that here, such as Jon going on about Jack and Jill going up a hill on opener "Funeral," most of the album tends to deal with New York City and the crazy changes it's gone through over the years. It's not preachy and not blatantly in your face about it, but the lyrics do unify the record and helps segue from song to song. At the end of the day, this is somewhere in the middle if I'm ranking all of the Jon Spencer Blues Explosion albums. I don't love it quite the way I do classics like Orange or Meat + Bone, but it's still a great record and probably one of the albums I've listened to the most in 2015 so far. If you're a fan, definitely pick it up. Corduroy - I'll Get Around To It 7"